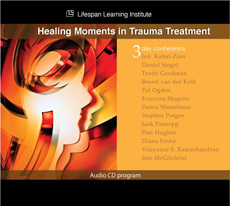 "This audio recording includes all presentations available from the 2011 IPNB conference. Here we bring together distinguished experts in the fields of mindfulness, attachment, trauma, interpersonal neurobiology, and trauma-based disorders.Presenters illuminate the mechanisms underlying how brain and body processes are shaped by attachment and emotion during development. Discover how the experiences of trauma, deprivation, and neglect impact the developing mind and how therapeutic relationship can promote healing. Preview audio samples included in this program: "
1. Outline 3 models for trauma treatment. 2. Integrate aspects of the mind/body connection. 3. Identify 5 steps in effective use of EMDR. 4. Describe 5 ways to use brain research in clinical treatment. 5. Evaluate 2 models designed to foster mindfulness in clients.